Test train heads west through the Northvale Trench. Click on any photo to see larger. Photos by Steve Hymon/Metro. The train heading toward Overland Avenue crossing with towers of Westwood in the distance. Train in Westwood/Rancho Park Station. Test train heading west toward Military Avenue and, beyond, the Exposition/Sepulveda Station. See our Flickr page to download full resolution versions of the above photos. 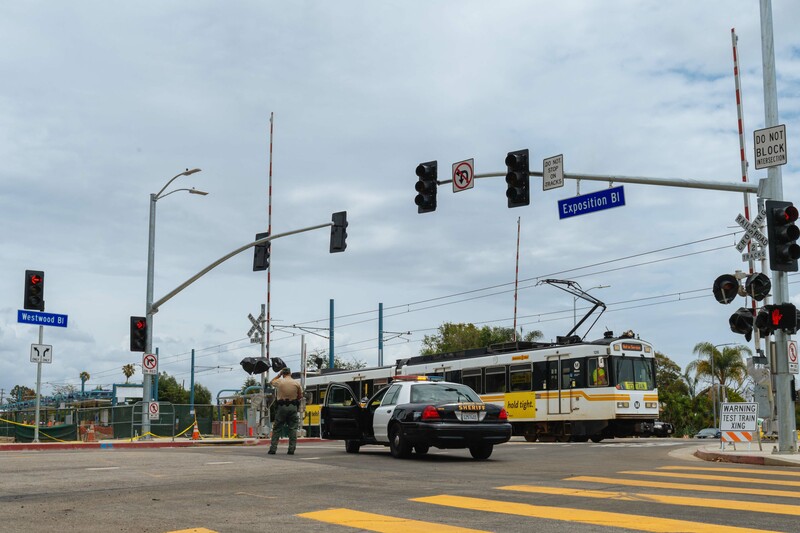 A new round testing of train signals and other electronics began Thursday for the second phase of the Expo Line between Culver City Station and Military Avenue. 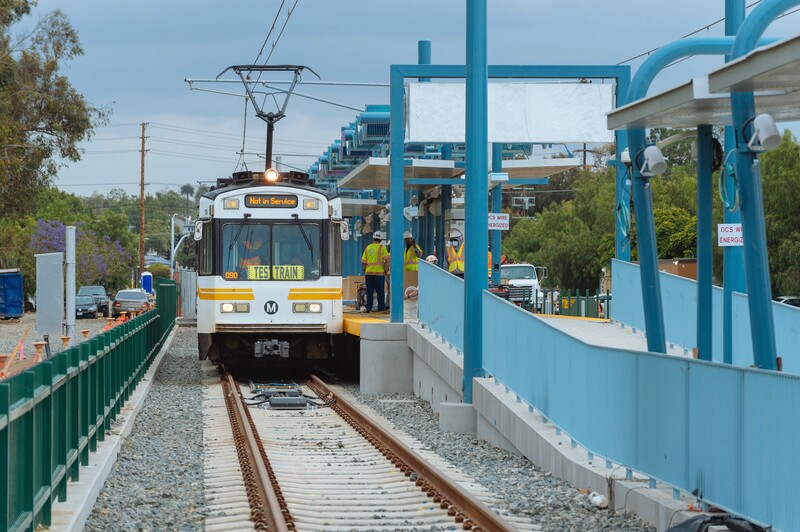 If you live, work or are visiting the West L.A. area please keep an eye out for test trains! The above photos were taken Friday afternoon adjacent to the Westwood Boulevard Station, which is just a couple blocks south of Westside Pavilion. 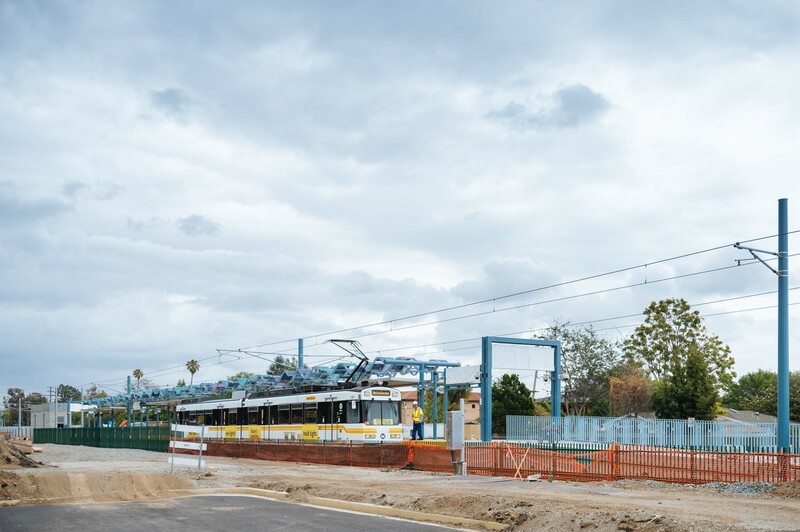 The second phase of the Expo Line will extend the rail line from Culver City to downtown Santa Monica, with a station just steps from the Santa Monica Pier, Santa Monica Place, the Third Street Promenade and Tongva Park, among other attractions. 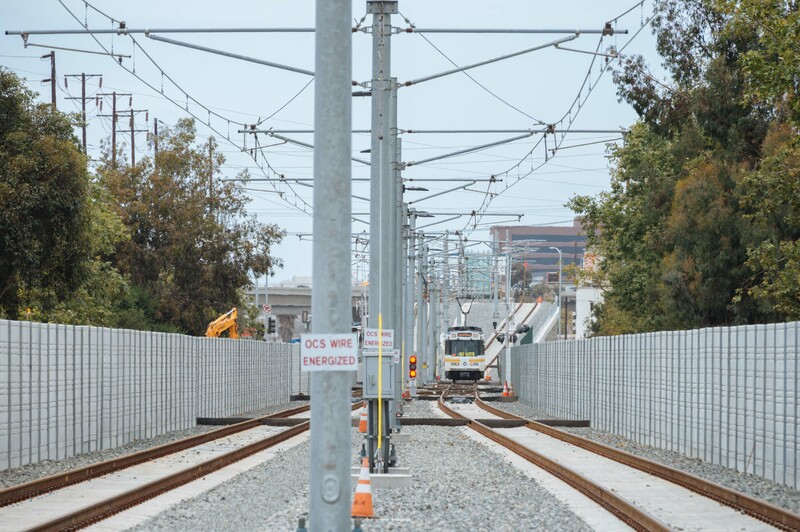 The project is expected to open in the first half of 2016; construction continues by the Expo Line Construction Authority while Metro has begun testing some aspects of Phase 2. The project is funded by Measure R, the half-cent sales tax increase approved by 68 percent of Los Angeles County voters in 2008. Photos: clearance testing for Expo 2 begins! Art for the Expo Line: all panels installed! Tagged as: construction, Culver City, Expo Line, Measure R, Phase 2, photos, Santa Monica, testing, West L.A. It all still looks photoshopped. In other words, unbelievable! Go metro! Cool photos! I’m so excited for the potential of the Expo Line. Would love to know how the tests are going,and if we can increase the frequency of tests to move opening day a bit earlier. The sooner the testing phase is completed and any issues are discovered and resolved, the better. Great shots, Steve! Very exciting. I don’t see any sign of bike path in these photos. What is the story? I think work on this portion of the bike path is running behind the train construction. Latest update to Expo Construction Authority Board doesn’t say much. I’ll ask around next week and try to get an update. Thanks Steve. I see from the other post that there is some bike lane in Westwood and other areas; however in your photos going through Overland area and tunnel, doesn’t even look like the ROW has room for bike path. Anything you can provide appreciated. And after all, it’s Metro’s Bike Week! Some sections of the bike path have just been paved but I don’t know if they are open. Browse through the Expo Line Fan web site http://www.ipernity.com/home/expo-line for the location details. The official project web site http://www.buildexpo.org/ only seems to get Construction Notices updates these days. Was driving northbound on Overland today and first tip-off of something “unique” going on is seeing the police cars posted at the street rail-crossing and then looking further to my right to see “The Test Train” going a little further East (back towards Palms/Culver City area) — it was a magnificent and nostalgic sight for me…to say the least. See, after living in Chicago for much of my early life and taking the “El Train” from North Shore suburbs to downtown (or playing hookie to go to Cubs games at Wrigley Field at Addison & Clark Sts.) 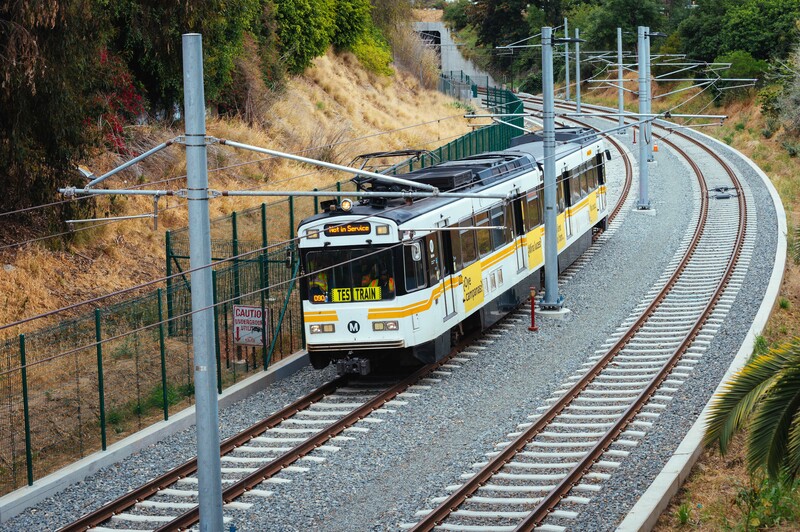 bought me to something I long ago took for granted — and it made seeing the “near future” of the Expo Line an exciting reality for Southern California residents, too! 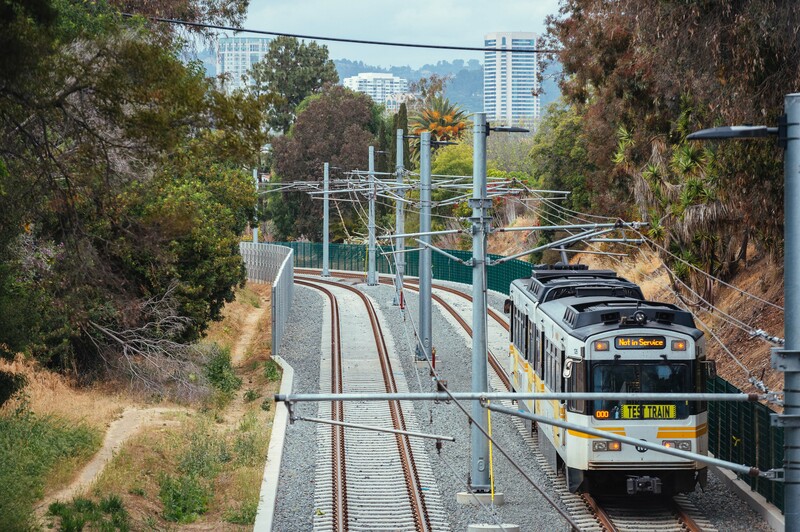 As a 27-year adopted Angeleno (transplanted from Chicago and Connecticut), these sights and sounds (of the sometimes clanking sounds of wheels and rails) bring back a flood of GREAT memories riding the rails to work and for recreation, too. 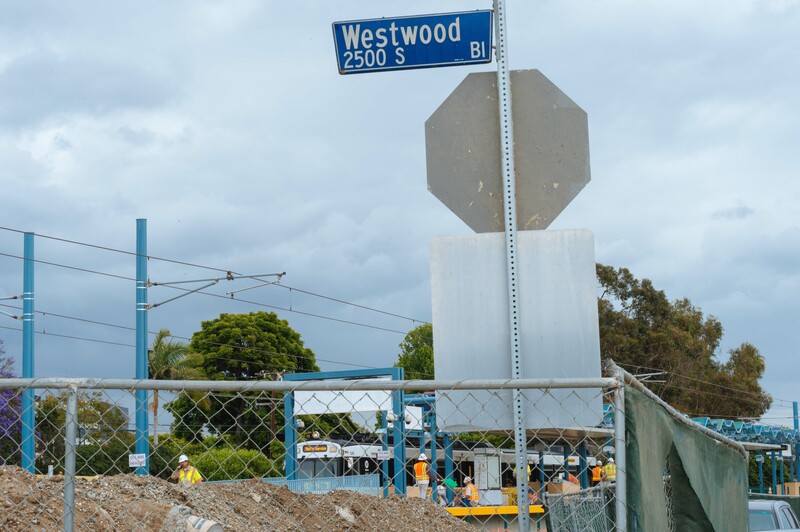 Every great city should have mass-transit rail access and it is heartening to see the ongoing expansion of the Metro Expo line into the Westside. The ironic and tragic thing, though, is that our cousin can’t recall the “original Exposition Line” streetcar that once used the rail access from downtown L.A. to Culver City and Santa Monica, because Pacific Electric and its trademark “Red Cars” were “bought out” by General Motors shortly after she returned from a Japanese-American internment camp (in Arizona) during the war. Alas, it seems like poetic justice that things have gone “full-circle” in terms of Metro’s beautiful and improved “Expo” Blue Line revives the elegance of the old rail access line’s varied, unique scenery — from Palms’ Cheviot Hills palm tree-lined slopes (from the Northvale Trench) through Sawtelle’s diverse/historic Japantown and to the seaside splendor and urban chic of the Santa Monica 3rd Street Promenade and pier areas – but it also unveils the cutting-edge engineering and architecturally well-thought-out station construction set to WELCOME whole new generations of rail commuters! Yep, it’s amazing wha the “thrill” of seeing something as simple as a “test” train car running all the way west to Westwood (at the risk of “directional” redundancy) can do to STIR THE MEMORIES and the SOUL for anyone who loves rail commuting and mass-transit. For that I would like to HEARTILY THANK the voters for passing Measure R in 2008 to fund Phase 2 of the ongoing Expo Line expansion from Culver City to the sea! Make no mistake about it, this modern mass-transit expansion is monumental as a “game-changer” for the Southern California community at-large, because the Metro’s similar Gold Line expansion will stretch rail service all the way to Asuza and the Expo-parallel northern Purple Line from Western Avenue all the way down the Wilshire Blvd. corridor to Beverly Hills, Westwood and VA Hospital grounds (on the north end of Sawtelle’s Japantown, too!) to make the Metro the largest mileage light-rail train service in the United States! What thrills me the most, though, is that poor to middle-class Angelenos of all ethnic/racial backgrounds will now have ACCESS to commuter rail service from east of downtown to Los Angeles all the way through the Westside and to the BEACHES of Santa Monica. Again, it really is the MONUMENTAL efforts of the Metropolitan Transportation Authority of Southern California making this amazing vision a REALITY soon for much of the region’s residents. OTOH you also have to question the whole fare concept of making people pay $1.75 (or $2.00 or $3.00 if fare increases continue to happen) living in East LA to do things like going to the neighborhood grocery store or going to their job which is a more frequent activity compared to paying the same price of $1.75 (or $2.00 or $3.00 depending on future fare increases) to go 20 miles or so to the beach which is something that most people do not do that often. Bringing in mass transit access is good. The fare system however needs to be re-evaluated, especially considering that 80–85% of Metro riders are poor and the vast majority of them do not travel that far on a frequent basis. The cost of extending Metro Rail involves future maintenance costs and one can look at what’s happening to our other rail lines when money to that is not provided. The money doesn’t end once Metro Rail is built, money still needs to be used for operations and maintenance. And money from that has to come from somewhere. You can’t keep raising taxes or fares forever or cutting bus services. You can’t keep making trips to the grocery store less than 2 miles from where they live to cost the same price as going to the beach 20 miles away. To have a sustainable and successful mass transit system, we need to move to distance base fares. People using Metro to go to the store, use passes. That is why the average fare on Metro is only 75 cents. Distanced based fares have some merit, but will result in a large increase for some people as the base fare will likely not decrease. We are due for a fare increase to $2.00 as we are still cheaper than distanced based system base fares in Washington D.C. and the Bay Area, but with minimum wage increasing to over $10 in CA and possibly over $13 in Los Angeles by 2019, people can certainly easily afford this. I somehow afforded a $1 fare in the late 80’s when min. wage was just $4.25. People have it a lot easier today. The section of the bike path between Westwood Boulevard and Military Avenue seems to be under construction right now. Thanks Steve. If I wasn’t familiar with the Northvale cut, I wouldn’t be able to figure out where the train had disappeared between C.C. and W.L.A. Great photos, Steve, especially in the trench! Great photos! 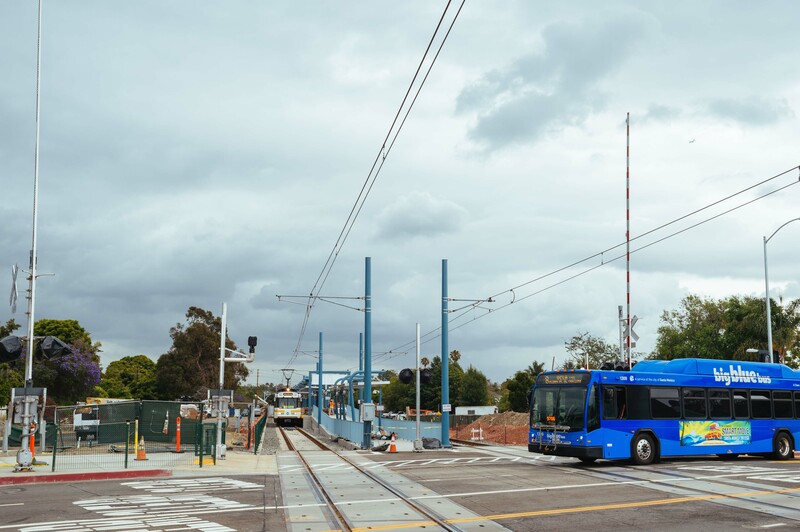 For 13 years, I’ve been riding the bus to Santa Monica, and for many of those years I hoped that maybe someday, there would be a rail line too. Now it’s almost ready! Thanks for sharing.